'Guardians Of The Galaxy': Let's Hear It For F.U.N. The most surprising thing about the latest film in the Marvel Universe may be as simple as its genre: while it certainly has your space battles and big fights, it's a straight-up comedy. 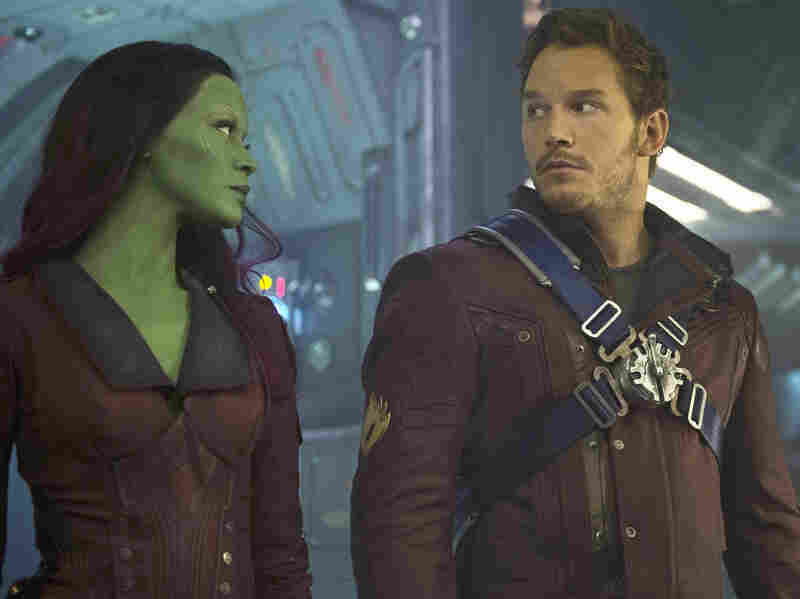 Gamora (Zoe Saldana) and Peter Quill (Chris Pratt) have some adventures together in the terrific new Guardians Of The Galaxy. The worst thing about making a post-Avengers Marvel movie is how far ahead of the game you are when you start. Your film will be marketed with brute force, treated as arguably the biggest opening of the summer, reviewed everywhere, and very likely to land among the most commercially successful films of the year, whether or not you do anything interesting with it. From a professional development standpoint, it wouldn't be unreasonable to describe your task as "don't screw up." There's no reason for that not to inspire cautious tiptoeing, for it not to motivate a precise tonal copy of what's worked in films like Iron Man and The Avengers, and ultimately for it not to lead to a zillion-dollar effort to ensure a solid, uninteresting base hit, creatively speaking. So it's particularly surprising how often Guardians Of The Galaxy feels very unlike other Marvel movies and other comic-book movies. Directed by James Gunn (who also directed the offbeat superhero comedy Super) and written by Gunn and Nicole Perlman, Guardians introduces us to Peter Quill (Chris Pratt), a capable and ambivalent wisecracking thief still working for the aliens who abducted him from Earth as a little boy, shortly after the death of his mother. As wisecracking thieves always do, Quill finds himself in a jam, and not long after, he's in jail with the mysterious and fearless Gamora (Zoe Saldana), the grief-stricken and huge Drax (Dave Bautista), a big walking tree named Groot (voiced by Vin Diesel) and the particularly mercenary Rocket Raccoon (voiced by Bradley Cooper). They soon find a common purpose, and we're off. There's an orb – oh, there's always an orb – and there's a preening and pronouncing bad guy (Lee Pace) who speaks at all times as if he's an action figure being waved around and given voice by a growling kid who's just recently discovered comics, and there's a message about the importance of friendship and teamwork. What distinguishes Guardians Of The Galaxy is its tone, which arrives early in the form of the '70s mixtapes that Quill got from his mom, which he still blasts on his adored Sony Walkman. After the brief prologue, we first find him kicking and cool-guy-dancing through the puddles of a faraway planet while Redbone's "Come And Get Your Love" plays. He's very much a Marvel hero, but Pratt – a tremendously charismatic actor whose work as the huge-hearted and slightly foggy-headed Andy Dwyer on Parks And Recreation foreshadowed some of what he's doing here – gives him both a shaggier charm and a much more specifically comedic carriage than most Marvel heroes. This is not the suave, swaggering wit of Tony Stark; it is a much more uncertain and blithely goofy thing. The simple fact that Guardians Of The Galaxy is closer to a pure comedy is what distinguishes it most. Iron Man and The Avengers certainly are witty, but they're not comedies, and this is. Where those films largely depend on well-timed ironic understatement and the occasional Hulk-on-Loki beatdown for their chuckles, this movie has jokes. Lots of jokes. Plain old jokes. Laugh lines. Punchy cuts between serious action sequences and bone-dry, deadpan takes. It has wonderful face-pulling. It has mechanical-eyeball comedy. There's plenty of heart in Guardians, but it gets its emotional heft largely from the warmth that this kind of comedy inherently contains. Genuinely funny people engender sympathy (see the witty Hans in Die Hard), so comedy isn't just for giggles, it's also for resonance. But here's the thing: it's fun. F-U-N. Remember F-U-N? The thing that blockbusters used to be before they started crushing cities full of innocent people and seemingly forgetting all about them? The thing that the Richard Donner Superman was? The thing that used to at least be one of the most important big-money-movie elements, alongside bloodletting, franchising, and an unrelenting, ashen grimness that could be rounded off to approximate seriousness of purpose? Yeah. Fun! I missed it. On the downside, Guardians is probably least inventive in its aesthetic: it doesn't play like a Marvel movie, but its visuals sure look like one. Orbs, explosions, huge spacecraft ... all of this has been seen. There are a handful of very pretty shots – Gunn seems to have a fondness for floating and uses it in several places to lovely effect – and there's a nicely manic fight sequence between Quill and Gamora early on. But the branding of the Marvel Universe is certainly more consistent and more easily felt visually than tonally. That music, on the other hand, is deftly chosen. Everybody from Stanley Kubrick to Michael Moore has done the bit where you play upbeat music over downbeat images for a kick of irony, but there are a few places in Guardians where songs, including "Hooked On A Feeling" (admittedly a well-worn weapon at this point), create a more complex sensation than the expected orchestral soundtrack would have. And while the other Marvel movies are similarly contemporary, they're also much more Earth-bound; it's a funny feeling – in a good way – to see people having epic battles over ancient artifacts in space and have the music create such a temporal link to this particular man's lost life on Earth. It's easy to create a clean break between the satisfaction of popular entertainment and the rewards of great art, and that divide, while not quite as easy to define as it seems, is certainly genuine. What's much shakier is the idea that the satisfaction of popular entertainment is valueless while the rewards of great art matter. There's always been a place for F.U.N. – it's always been one of the reasons people seek out culture. To see it done really, really well, with purpose and energy and wit, is itself awfully rewarding.